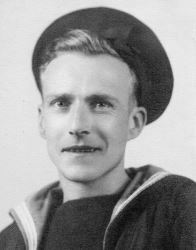 Biographical Information: Robert John Wells was one of six children, and worked as a gardener and nurseryman with his father, before joining the Royal Navy, aged 16, in 1936. Following his time in Hood, Robert later served in the battleship HMS Malaya, and also in Sierra Leone in Africa (HMS Eland) and Sri Lanka (HMS Lanka). He left the Royal Navy by purchase in 1948. Robert married Ivy Markham in London in 1945 and had two children. He had various jobs, and was self-employed, because Ivy became severely disabled after illness in early 1950's: Robert had to care for her and their children. Ivy died in 1960, and Robert moved to Stowmarket, Suffolk in 1966. He died after a heart attack in 1980.